I arrived in Southwestern Ontario in 2000, just as the manufacturing sector’s collapse was taking hold. I spent the better part of a decade witnessing the destruction first-hand. It was heartbreak in the heartland. What transpired was akin to a cruel crossword where all the words relate to economic devastation. Kellogg’s, Heinz, Caterpillar, Ford, Smucker’s, Navistar—companies that once underpinned Ontario’s economic success—all disappeared one by one. What replaced the plants and jobs were insecurity, precariousness, anxiety and the unspoken acknowledgement that the good days were over. 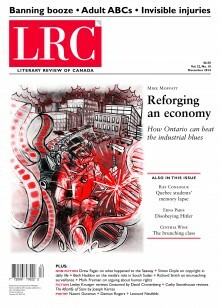 It wasn’t any one factor that finally stalled the engine of Ontario’s economy. Rather, it was a combination of forces: the petrodollar driving the exchange rate higher; the push toward liberalized, global trade regimes; automation; deindustrialization amid a shift to the tertiary sector; and the entry of a massive labour surplus in Asia providing access to low-wage workers. By the time the financial crisis hit, the basic pattern had been set and nothing could reverse the trend. Politicians certainly lack the sense of urgency that one would expect. In the past two provincial elections in Ontario, the southwest region’s problems have barely registered among voters, which is astounding given that the region is now a substantial drag on the province’s economy. Outside the region, there appears to be a disconnect about the seriousness of the situation and rarely does discussion about the region’s problems (or possible solutions) enter mainstream discourse. I have close friends in Guelph, Windsor, Waterloo and London. I worry about what the future holds for them and their children. I’m not as optimistic as Moffatt is about the region’s prospects given the larger forces in play. What we’re seeing is a declining quality of life, fewer jobs and depopulation as young people flee. These economic problems are structural and a downward cycle has taken hold. While it’s possible to arrest this decline, it won’t be easy, and I wonder if the political appetite exists to make the necessary choices. I would echo Moffatt’s call that governments need to work toward a common vision. It’s necessary to begin coordination on a regional level to develop a holistic strategy encompassing the workforce, industrial, social and economic goals. Ontario can ill afford the region’s continued decline; while it’s uncertain what the outcome will be, charting a new course is a necessary exercise given the importance of this part of the province. While my family spent a year in France in the 1970s I spent some time sitting on Juno Beach, and tried to understand why there was such a difference in attitude between the Dutch and the French, the Dutch were so friendly and appreciative of Canadians, the French quite the reverse. With a couple of notable exceptions, the French petits commercants – butchers, bakers, hatrdressers, etc – were very friendly, but middle and upper class French wanted nothing to do with us, and that includes the professional people with whom my husband worked. Our rather indifferent ability to speak the language could not be the only reason for this coolness. I have since come to believe that the American decision to allow de Gaulle and Leclerc to be the first to enter Paris following the German retreat was not a wise move but in fact a disastrous one. De Gaulle and Leclerc did not liberate France, and by lying to themselves about it they missed the opportunity to start to face the rather shoddy behaviour that had taken place in occupied France. A little humility would have been a good first step. Perhaps a French speaking Canadian regiment would have been a good choice for that entry, and might have provided a reminder of considerable Canadian blood shed to liberate Caen a short time before. Certainly that slate was cleared and no thanks was ever given to their saviours. Perhaps too we might have been spared that boorish behaviour of de Gaulle in Quebec City during our hundredth birthday celebrations. Certainly the Germans, with a much more shocking past have done a better job of coming to terms with their shame than have the French. Unlike London, Paris may have been been relatively untouched by the war, but one is tempted to suggest that Parisians lost a part of their souls. I am not in a position to judge the accuracy of much of the other sections of the article, but I am loath to accept much of Mr Hansen’s remarks at face value if he can be so wrong about the French.